A source defines a set of configuration parameters for a specific Google Apps for Work account. Select the connector used by this source. In this case, select Google Drive (Google Apps). If you do not see Google Drive (Google Apps), your environment does not meet the requirements (see Google Drive for Work Connector Requirements). Do not select the Google Drive (Single User) option. This parameter is not used, but must not be empty. Enter http://www.google.com. Select the field set that you created for your Google Drive source (see Google Drive for Work Connector Deployment Overview). In the Mapping File box, optionally enter the path to a mapping file that should apply to the items in this source. Leave this box empty to use the default mapping that should be appropriate in most cases. When the default mapping does not fulfill your needs, contact Coveo Support for assistance. Your XML mapping file must respect the standard Coveo mapping file schema (see Standard Mapping File Schema). Enter the domain admin account email used to obtain the list of users in the domain. Note: The e-mail you enter here must be the same as the one you entered previously when configuring the security provider (see Configuring a Google Drive for Work Security Provider). Enter the Google Drive domain that you want to index. When your Google Apps account contains more than one domain, you can enter a semicolon-separated list of domains to index. Important: The domain(s) specified in this list must match the one(s) specified in the security provider [Domain-wide mode] Managed domains list (see Configuring a Google Drive for Work Security Provider). Note: CES 7.0.7599+ (April 2015) This parameter is no longer required and can be left empty when you use the ServiceAccountPkcs12FileData hidden parameter (see Modifying Hidden Google Drive for Work Source Parameters). Select to index the items in the user's trash. Not selected by default. Select to index custom properties that Google applications or your custom applications added on items. Not selected by default. 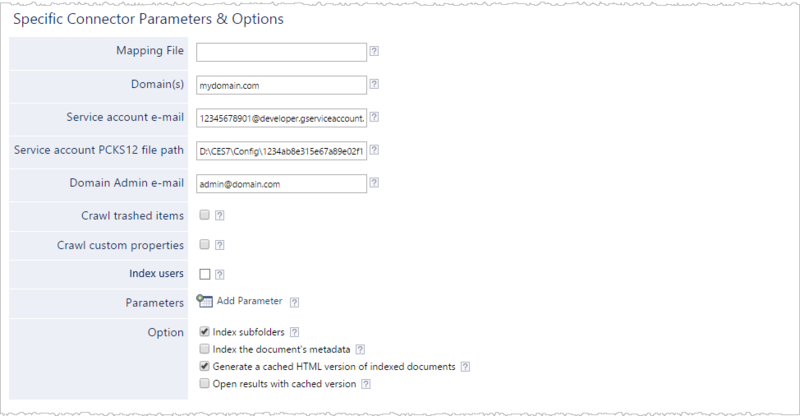 Note: Crawling custom properties adds one API call per indexed document. 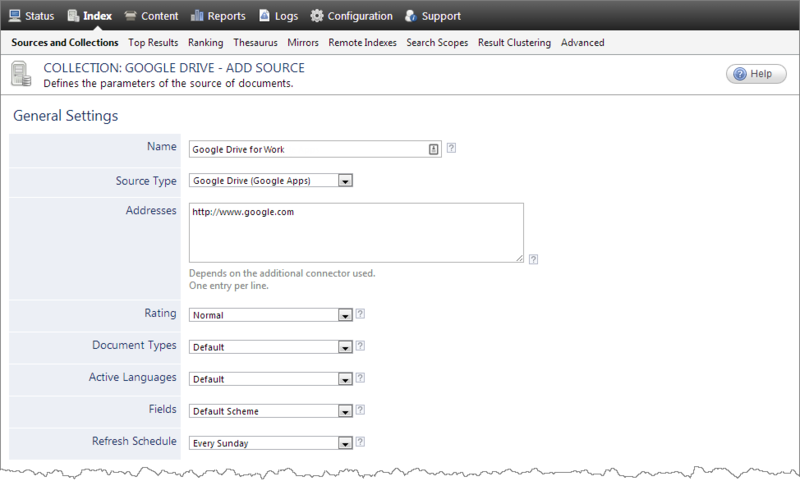 Selecting this option can notably increase the number of calls to the Google Drive API and the crawling time. Select to index Google Drive users as separate documents. Not selected by default. Click Add Parameter when you want to show and change the value of advanced source parameters (see Modifying Hidden Google Drive for Work Source Parameters). Ensure that this option is selected because Google Drive document IDs are case sensitive. When you chose to index Google Drive permissions, in the Security Provider drop-down list, select the Google Drive for Work security provider that you created for this source (see Configuring a Google Drive for Work Security Provider). CES 7.0.7433+ (February 2015) Select (none). CES 7.0.7338– (January 2015) Select the user identity that you created for this source (see Google Drive for Work Connector Deployment Overview). When you are ready to start indexing the Google Drive source, click Rebuild. Consider modifying some hidden source parameters to try resolving other issues (see Modifying Hidden Google Drive for Work Source Parameters).